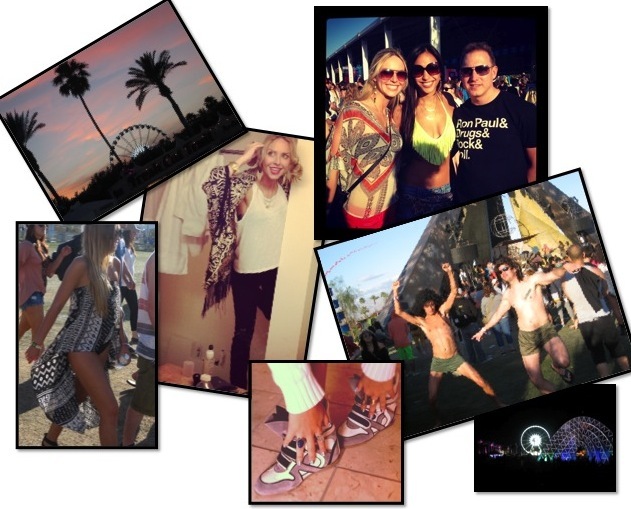 Last weekend I went to Coachella for the first time and let me tell you, it was a whirlwind. From Kaskade to Dr.Dre there were some amazing performances. Besides a freak rain storm Friday night and cool winds Saturday (I had to go to Target and buy jeans, No Joke!) weather was ideal. I've always been more comfortable behind the lens, but what the heck...below are my looks and some fun extra shots from the festival. We love the outfit of day one. Giirrrrl, you fit right in with Coachella's fashionistas!! Love your outfit selections! Looks like an unforgettable time! It's on my bucket list, so hopefully I will make it sooner than later!! Thank you for sharing your experience, great post! So exciting that you attended the festival! Its great to hear about from a blogger and not the media. Your outfits were so apt and adorable for the festival, you look terrific! Gorgeous. All of your Coachella looks are perfect. Thanks for coming by my blog and leaving a comment. You made my day. Amazing Coachella outfits! Thanks so much for stopping by my blog. I adore that kimono jacket and the orange shorts! You should have so much fun! loving having come across your blog today. Great inspiration filling it - I'm looking forward to checking back in :) I'm your latest follower too. Love the outfits! Like the neon strapless bra under the white t-shirt, great idea! Thank you for taking time to visit my blog! I've been follwoing yours on bloglovin for some time, follow you now back on gfc! Hope you might wanna follow me too on bloglovin! Have a nice weekend! Looks fun! I've always wondered what Coachella was like. I'm with you on the Beauty Blender. I'm going to buy one and try it out! It's great to see "the other side of the lens!" You looked super cute! I have gone to Burningman Festival for the last two years. No mirrors, no showers for a whole week!!! It's a little crazy to let go but nice at the same time. But, I did need some serious detangler after the fact. hah! Cute post! like to follow each other!!? I am so jealous you got to go to Coachella! It looks like you had a blast! You're so daring with your bare belly and day-glo bra. Love it! Oh my goodness! I have heard such wonderful things about Coachella and it is on my bucket list for sure! Looks like you had a fab time, and you looked gorgeous to boot! LOVE all of the outfits!! Really love your sense of style ! Thanks for the sweet comment you left on my blog, I'm following you now! I really love the second one, you look so boho and fun. i love this new bandeau top craze, i can't wait to get on that. Waw, you look so pretty! Love this post! Coachella looked ammazzing!!! You're gorgeous and the photos are pretty amazing!! Cute pics! I didn't go to Coachella this year but all my friends that did had an amazing time, hope you did too! Gorgeous looks an so Coachella! Love the most No.2! The poncho with the South-American pattern is fabulous! Following you beautiful blog dear! your blog is amazing!can we follow each other? You look great! fun pics! Coachella Outfit Nr. 2 is the best! Love this bandeaux - top!! The second outfit i love it!!! So pretty and you look gorgeous! I have a nice giveaway, check it out! Come back and visit me sometime, I'll definately be back! You're amazing! i love your blog, i'm following you! lovin' your blog can't help but follow... good job!